The UWIB ETSY Team is hosting their monthly blog hop today! And our theme is spring! The calendar says it is spring; but in the midwest we are wondering if spring will ever come. We still have snow on the ground and below normal temps. And a week ago we had rain, sleet, and snow all in the span of less than 24 hours!! But enough about the weather. Let's turn our attention towards spring! To me spring means warmth, sunny skies, green grass, and budding leaves! So for my blog hop I decided to feature items that remind me of the sun - the color yellow, the sky - the color blue, and green - the color of grass and leaves! This set of hand-chenilled potholders incorporates all three colors - yellow, blue, and green! 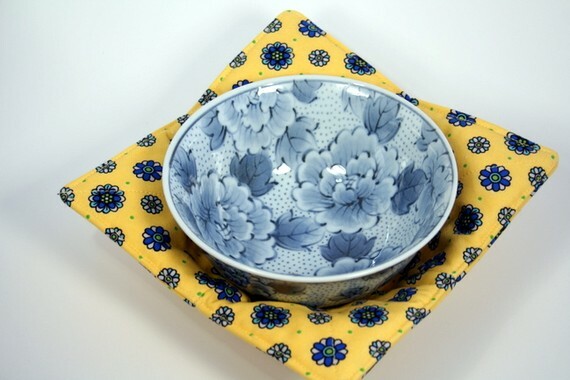 I also have a coordinating Microwave Bowl Potholder that highlights the blues and the yellows of a bright sunny sky along with a touch of green here and there! Now what about those budding leaves and green grass that bring with it the fresh scent of spring, especially after a refreshing rain? 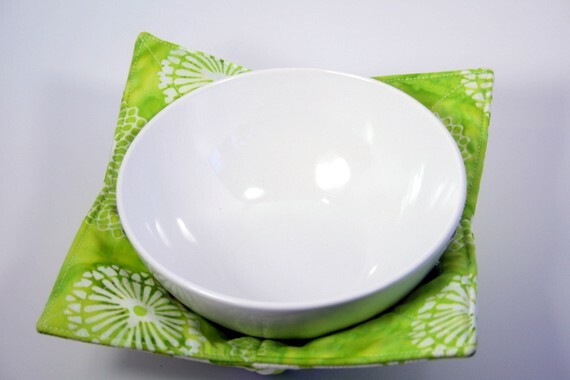 Here's another Microwave Bowl Potholder for you! In the spring time, as the leaves are budding, I enjoy watching the sky through the limbs of the trees. 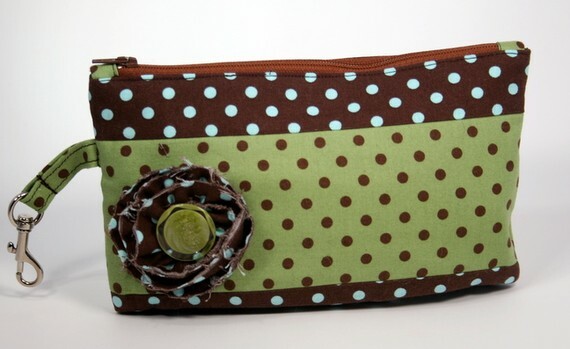 This zippered pouch has bits of the sky in its blue polka dots, the bark of the trees in its browns, and the green of the budding leaves! How perfect for spring!! We have a good turn out for our blog hop today - please visit the blogs of our participating members and see what else UWIB has for you to enjoy for spring! OOOOH, what lovely colors. I adore your work Rita! the blues and yellows. yum! Having a great time reading unique women in business blogs on SPRING! Let’s shop and blog hop! I really like the microwave bowl potholders. They would have come in handy tonight when I was bringing hot dishes to the table. I agree with you - being that I also live in Minnesota - it's hard to remember that it's spring with the snow still on the ground. We saw 4 red-winged blackbirds today...a sure sign that more migratory birds will be returning here soon! Rita, You are one of the most creative and innovative people I know! Just look at those clever microwave potholders! I have to get me one or two or three! Love the wonderful Spring colors and especially that very cool microwave potholder. I still haven't decided if I'm going to attempt the tutorial or just be lazy and buy one of the gorgeous ones you've made. 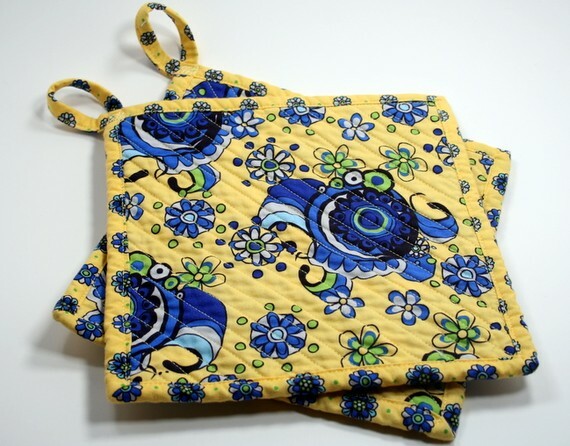 I am crazy about those microwave potholders, they are going on my want list, I love the lime green batik. Love the microwave bowl holder idea! Just love it. I love the fabrics you choose and have several of your items on my wishlist! Wonderful selections...and I hope your weather catches up with the season. We're quite soggy here, too! Looking forward to Spring and more blog hopping! Just like everyone else is saying, those microwave potholders are brilliant! Rita, I love the new microwave hot pads. I know they will be in all my stocking this Christmas. Love them! Cute zippered pouch and very inventive microwave bowl pot holders! Those items would make such great gifts! Greetings from not-so-sunny Hotlanta! I feel your pain as I grew up in Chicago and spent my summers in Eagle River, Wisconsin. I really like your microwave bowl potholders and your great choice of colors. I'm off to the next blog; thanks for having me! Your shop on Etsy is a little bit of sunshine. The choices that you have made in materials , all have that uplifting feel. And as everyone says, your microwave potholders are pure genius. The potholder for the microwave is a very good idea! You know I love your microwave bowl holders! Blue and white is a classic and makes me think of my Aunt's garden - she was a big collector of blue and whiet dishes. Love the colors for those pot holders. Blue and yellow is a great kitchen color combo in my opinion. Thank you for organizing this bloghop! I love your microwave bowl pot holders! Love your spring inspired items, Rita. My new fave has to be the microwave pot holder!